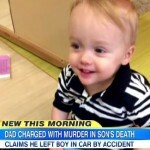 Dan appeared on Good Morning America, Monday June 23rd to discuss the story of a Georgia man who is charged with murder for the death of his 22-month old son,whom he left unattended in a hot car for 7 hours, supposedly by accident. Justin Ross Harris was on his way to work just outside of Atlanta, when he forgot to drop off his young son at daycare. It was not until seven hours later when Harris realized his mistake and immediately rushed to save his son but sadly, it was too late. The police arrested the grieving father and charged him with felony murder and child endangerment, to which he has plead not guilty. Says Dan, “As the father of a boy that is almost exactly the same age, to hear this case is absolutely heartbreaking. It’s not at all a typical murder case. First of all the charge is felony murder, meaning they charged him with cruelty to a child and because there was a death as a result of that felony, they can charge him with felony murder. But I have to tell you, the way that the police are talking here, making comments there’s more to the story than people know. One 34-year-old vet involved in the case said this case shocks the conscience. That kind of language suggests that they think there’s something else to the story.” Watch the full clip here.